Lifeguards Mike Gilmore and Jim Birdsell (3rd unidentified) are assisted by off-duty firefighter Rob Lukaszewicz during a dramatic rescue of man off Sunset Cliffs on Monday, July 19, 2010. Photo by Jim Grant. There has been troubles at OB’s dog parks recently – there have been mauling and deaths of small dogs at both Dusty Rhodes Dog Park and Dog Beach. In response, a community meeting is being held tonight, July 22nd, at the OB Recreation Center at 5:30pm. The Rec Center is at the corner of Santa Monica and Ebers. The meeting is being hosted by the Dusty Rhodes Rec Council. 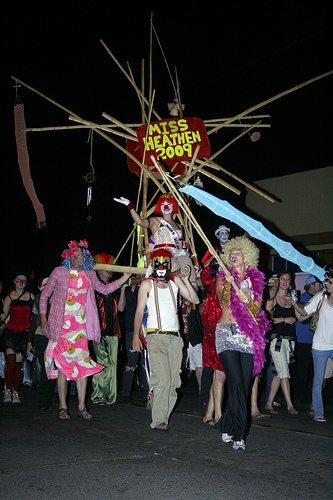 The annual Heathen Procession will begin around sunset, 7:30ish, and proceed from Dusty Rhodes Park to Sunset Cliffs Blvd to the foot of Newport Ave. and end with a bonfire on the beach. Organizers hope to have cooperation from the SDPD that will allow them to stage their circus-like procession down Newport and to perform their traditional ‘dance in the street’ at the intersection of Bacon and Newport. Sometimes, you just can’t get away from your public duties if you’re a first responder. OBcean Rob Lukaszewicz was reading quietly on his deck overlooking the cliffs on Monday late in the afternoon when he spotted somebody seemingly in trouble out in the ocean. Rob, a firefighter for nine years, grabbed his binoculars, and sure enough – some guy was having problems with a small boat. Rob grabbed his surfboard and paddled out to see what was going on. He ended up helping to save a man’s life. Sunset Cliffs Benches: $3000 X 15 = $45,000 – YIKES! New $3000 bench supplied by cash-strapped City of San Diego. Photo by Jimi Olsen. The San Diego City Parks and Recreation Department has installed the first of 15 ipe wood benches at Sunset Cliffs Natural Park. The new bench is located just south of the foot of Hill Street on Luscomb’s point (near the surf break somewhat recently renamed “Mouse-Scombs”). Mike Ruiz of the City’s Shoreline Parks Division says he is waiting for the new fiscal year funding to be approved before he can go ahead and install more of the hardwood benches valued at $3000-plus each. Our own Gary Gilmore, Newport Ave’s favorite goldsmith, was interviewed by the Voice of San Diego just recently. In his column The People Project, Sam Hodgson, has Gary recount an incident that occurred years ago, when a would-be burglar gets trapped trying to slide into the jewelry shop through the ceiling vent. The cops arrive and find the guy – and start laughing. The media shows up … more TV cameras show up. And boom, the next day’s business was like “the day before Christmas,” says Gary. For the Voice interview, go here. 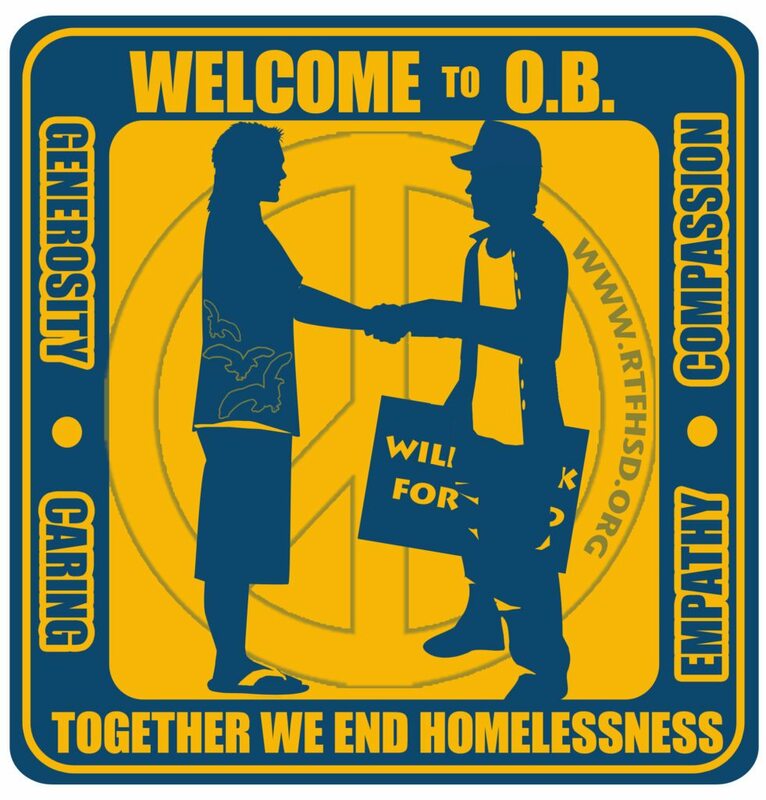 let’s roll a warm OB welcome for San Diegans 4 Great Schools at the OB Town Council Mtg. Come meet the people who are only “thinking about” taking your right to vote for school board away! San Diegans 4 Great Schools? I don’t have a lot of faith in anyone who uses numbers in place of letters. You aren’t sending a text message to your bff you know!